Kids, Cows and Grass: My inspiration! 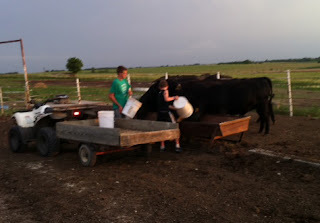 Everyone needs a reason to do what we do--I love running a cattle ranch! The work is all worthwhile when we have weekends like this past one! It has become an annual tradition to have our cousins visit us over the Independence Day weekend. They live in Denver, have a beautiful family of four kids ages 10 to 3 years, and are highly educated, very athletic, and interested in feeding their kids good, healthy, safe food. They didn't grow up on a farm. Shannon is my husband's second cousin and her mom was raised on our farm, but when she married, she moved to the city and kept her family in touch with the farm by visiting when they could. Today, Shannon and her husband Jerry have chosen to keep their kids in touch with their long rural roots by visiting our ranch. We are very blessed to be able to watch these kids grow up and have some impact on their knowledge of how food is grown. and hang out on the back deck waiting for the homegrown beef burgers to finish cooking on the grill! Along the way, we talk about our life on the ranch and how we are proud to be producing food for the world, and they tell us about their life in the city--from Jerry's firefighter stories to Shannon's teaching and coaching, and the kids all have stories to tell about swimming and school! We are very blessed to have this family in our lives and hope they feel the same. 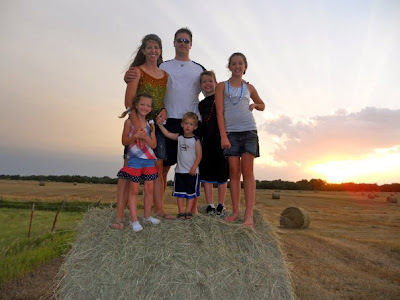 When I write a blog post, I keep Shannon and her family in mind. They are the kind of people that I write for--the ones who are interested in their food and want to know more about life on a ranch.